Rex Beach was born in Atwood, Michigan to a prominent family and pursued a career as a lawyer before being drawn to Alaska at the time of the Klondike Gold Rush. After five years of unsuccessful prospecting, he turned to writing. 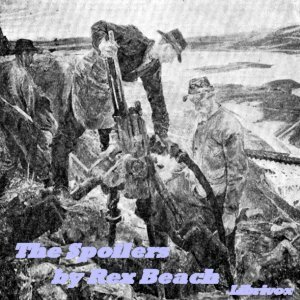 His first novel, The Spoilers, was based on a true story of corrupt government officials stealing gold mines from prospectors, which Beach witnessed while he was prospecting in Nome, Alaska. The novel begins with the return of Dextry and Roy Glenister to Nome to reclaim their mine, The Midas. On their arrival, they find “The Law” has come to Nome. The problem is “The Law” is crooked, bent on stealing all the best gold mines in Alaska. Alec McNamara is the villain in this novel and rules with a heavy hand through the aging and corrupt Judge Stillman. Helen Chester is the naïve niece of Judge Stillman. She cannot believe her uncle is involved in such treachery. And of course, Roy Glenister is in love with her. After trying to work within the law, the miners eventually form a vigilante group called The Stranglers to right the wrongs while Glenister continues to believe the law can correct the wrongs. A cast of other characters enter the book with various roles; Cherry Malotte, The Bronco Kid (who has a surprise in store for listeners), Slapjack Sims, Struve the crooked lawyer. The climax of the book is…………but then I would be spoiling the ending, wouldn’t I? The Spoilers became one of the bestselling novels of 1906. The novel was made into movies five times, with leading men including Gary Cooper, Randolph Scott and John Wayne. For a brief pictorial history of the characters involved in the actual mine stealing, please see this page.